With a heavy heart we announce that Paulette April Shewfelt (nee Osterbeck) passed away on Monday, August 14, 2017 at 8:24 p.m. after a long battle with cancer. Paulette was born in Redvers, SK April 28, 1965. At a young age she moved with her family, mother and father April and Richard and brothers Wayne and Sean to Brandon, MB. Paulette graduated from Crocus Plains High School, Marvel Hairstyling School and Assiniboine Community College as a book keeper. In 1992, Paulette married Allan Shewfelt. In 2017 they celebrated their 25th anniversary. Paulette loved life and tried to experience all that she could. She will be missed by family and friends alike. The Ceremony to Celebrate Paulette's Life will be held at Keystone Baptist Church, 159 Madison Crescent, on Saturday, August 19, 2017 at 10:00 a.m. Flowers are gratefully declined. 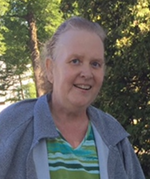 Donations in memory of Paulette may be made to the Brandon Regional Health Centre Foundation for Western Manitoba Cancer Centre, 150 McTavish Avenue East, Brandon, MB R7A 2B3 or the Brandon Humane Society, 2200 17th Street East, Brandon, MB R7A 7M6.